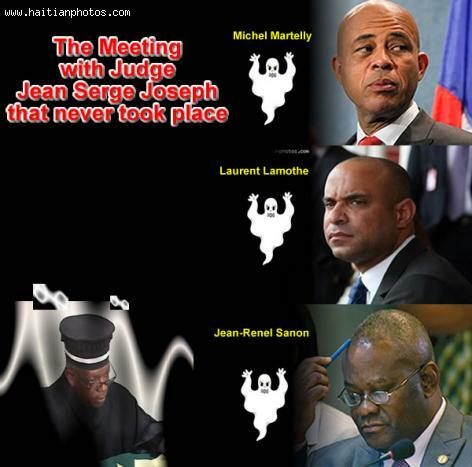 Senate Special Committee has found that there was in fact a meeting between magistrate Jean-Serge Joseph, President Michel Martelly, Prime Minister Laurent Lamothe and Minister of Justice Jean-Renel Sanon before his death. In addition, the Committee recommends among other things that an indictment procedure is put in place to confront President Michel Martelly, Prime Minister Laurent Lamothe and Minister of Justice Jean-Renel Sanon. All three are accused for having lied to the nation and to the commission during this investigation. According to the Newspaper "The Nouvelliste", the Senate Special Committee found that the meeting took place on July 11, 2013, in the office of Mr. Garry Lissade.